It's the last Friday of the year, and I can't think of a better way to send out 2011 than with an embarrassing bang of honesty. I am not leaving this chair until I finish this post. I will finish a post before 2011 is over. Well, I might have to leave the chair before I'm done because I'm going to meet a lady who's buying some of my scrapbook organizers off Craigslist. The problem I have with selling stuff on Craigslist is that as soon as someone tells me they want my stuff, I suddenly have seller's remorse and want to keep it. What if they know something I don't and this thing is going to win big bucks on Antiques Roadshow? It's all very unsettling, and that's without throwing in the 'meeting a stranger for a cash transaction' thing. And doing the exact opposite of everything it suggests. We did all that stuff too, but we didn't stop there. and tore apart the kids' bedroom to paint it. It was all certainly productive, but I don't know about the 'stress free' part. The good news is, for Christmas I got running water and the dings and dents in the wall fixed! During the 'Great Sink Project' of 2011, we had to go back to Home Depot approximately seven times. The seventh time I was sent alone to retrieve a very specific plumping part. Do you know how many little baggies there are in the plumbing aisle that look exactly like that one? Pretty sure that's the equivalent of asking my husband to go to the mall and bring me home a swimsuit that is flattering. We continued our Elf on the Shelf tradition this year, and for the most part he was very well-behaved. Although there were a few days in there where he didn't get moved to a new spot, and he got a little ornery. He's seven and very sweet, but I'm never quite sure what will come out of his mouth next. "Hey GG, I've been wondering about somethin'.... how are you still alive?" Last night while Jarrod was out having a 'guys night' I got the bright idea to simultaneously bathe the 2-year-old and give haircuts to the older boys. "Uh ohhhhhhh. I poop in the baff! That's super yucky. MAMA, I POOP IN DA BAFF! Oh noooo!" So I left Rowan sitting on the stool and went to take care of the, ahem, situation. When I came back, I really should not have been surprised that Rowan had started on the haircut without me. I left a 4-year-old in a cape with scissors right next to him, what did I expect to happen? Luckily, his massive cowlick in the front disguises the fact that all the hair right there is three inches shorter than the rest. In fact, it doesn't look half bad. I probably won't even fix it. Because that is the art of stress-free productivity. If it's not important, just let it go, man. And last but not least, I'm 'fessing up that I never posted the lastest episode of Kid History even though I've thought of it about 20 times. So in case you haven't seen it yet, here's the Kid History Christmas episode. 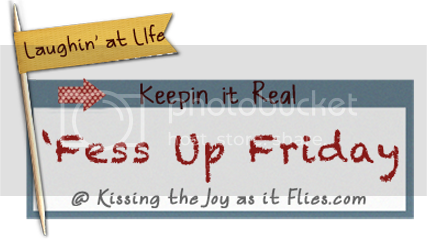 Thanks so much to everyone who participated in 'Fess Up Friday this year. I was so pleased to have you wonderful, hilarious ladies joining in with me, and I met some real kindred spirits along the way. Hopefully in the next couple months, when all this home improvement hoopla dies down, I will be able to get back to blogging as usual. I miss ya'll! Or maybe I'll just watch Star Wars for the 9zillionth time with my guys on the couch? I'll keep you posted! LOL! You remain one of my heroes!! Happy Happy New Year! Man oh man I love your elf! Makes me sad that we were not able to use ours this year. Next year I bet he will be ready again! Are you excited for January and all the organizational sales and blog posts and challenges coming? I am! :) You have gotten a jump start on all of us lucky girl you! I'm coming back! I hope you do this again next year because I am totally coming back! I think I totally needed to start off my new years eve with your FUF, Kid history and last night Amy sent me Pioneer woman's " all I just wanted a doughnut." my friends must know right now I really need to laugh....house stuff is too much stress! You should get a shirt made. So great.